University School's Public Forum Debate team finishes fifth out of 270 teams. For the sixth time, US receives the School of Excellence in Debate award, given to the top 20 debate programs in the tournament. 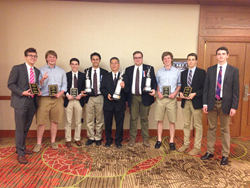 Members of University School's Speech and Debate Team at the National Tournament in Dallas with head coach Peter Paik. The students worked hard to improve throughout the competition, and showed strong character both in and out of their debate rounds. Eight students on University School's Speech and Debate Team recently competed in the National Speech and Debate Association National Tournament held in Dallas, Texas. In Public Forum Debate, the team of Aidan Brandt ’15 and Armin Ameri ’15 won 12 straight debates, finishing fifth out of 270 teams. Ben Wesorick ‘16 and Will Frankel ’17 finished among the top 30 Public Forum Debate teams. Chandler Koon ’15, winner of this year’s City Club of Cleveland's High School Debate Championship, advanced to the eighth round in Lincoln-Douglas debate. Andrew Gilmore ’17 also competed in Lincoln-Douglas debate. John Mino ’16 and Geoff Schoonmaker ’16 participated in a new event called World Schools Debate. They were undefeated in their preliminary rounds, 6-0, but lost in the double-octa final round. For the sixth time in the last eight years, University School received the School of Excellence in Debate award, which is given to the top 20 debate programs in the tournament. No other Ohio school received this honor. Commenting on the team's results, Peter Paik, head coach of University School's Speech and Debate Team, said, "I am especially proud of this year's participants in the national tournament. They worked hard to improve throughout the competition, and showed strong character both in and out of their debate rounds. They also pulled together as a team very well. I want to thank my assistant coach, Humzah Quereshy '13, for his active support of our students throughout the week of nationals." Founded in 1890, University School is an independent day school, educating boys in kindergarten through grade 12. The school’s mission is to inspire boys of promise to become young men of character who lead and serve. Our dedicated faculty, rigorous curriculum, and experiential programs foster intellectual, physical, creative, and moral excellence. University School is a diverse and inclusive community where each boy is known and loved. University School maintains two campuses: the Shaker Heights Campus has 460 students in kindergarten through grade 8; the Hunting Valley Campus is home to 420 students in grades 9-12.